From a slamming six-piece band that will rock the largest festival crowd to a budget-pleasing duet or trio, this eclectic group transports your soul (and soles), on an exciting worldbeat dance tour. “They have an amazing repertoire … they have that authentic chutzpah that makes the music come alive … This band knows how to reach everyone, regardless of age or background.” — Michigan’s BlissFest festival brochure on the band’s third appearance there. To make sure folks connect with the powerful roots music, this engaging, skilled band teaches and leads circle and lines dances when circumstances allow it. The audience is encouraged to drum along on percussion as well as sing along. The entire family, from toddlers to seniors, gets to join in the very accessible fun! Most of the Hi-Dukes are multi-instrumentalists, a fact which allows the band to create an ever changing color, but whatever the sound, every number grabs your attention, gets your feet tapping, urging you to dance. 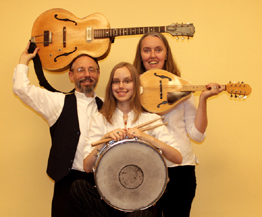 The core trio plays eight instruments: Mandolin, Violin, Greek Baglama, Guitar, Bulgarian Flute, Percussion and Drums, Ocarina, with three singing voices. Additional players / instrumentation can include: Acoustic Bass / Tuba, Trumpet / Saxophone, Trombone, and Percussion. Download a printable One Sheet Brochure. Founded in 1990, the Hi-Dukes tour in Europe, Canada, and across the U.S.A., pleasing audiences at fests, concerts, corporate events, and private parties. Schools and libraries are especially happy to sponsor the bands unique, interactive, educational assembly programs and residencies / workshops. The Hi-Dukes also present master classes and lecture / demonstrations at universities and colleges. The band’s newest program, the Hi-Dukes World Music Youth Orchestra and Band project got underway in Fall 2015 thanks to a grant from the Evanston Arts Council, a city agency supported by the City of Evanston and the Illinois Arts Council, a state agency. Since 1995 the Hi-Dukes have served special needs communities internationally with programs geared to folks with cognitive disabilities like autism and Down Syndrome. Again, a big Thank You! to both the Evanston Arts Council and the Illinois Arts Council for a 2017 grant to run a dance program, “We Just Want To Have Fun, Too!”, in the Summer of 2018 geared to the Special Needs community of Evanston. 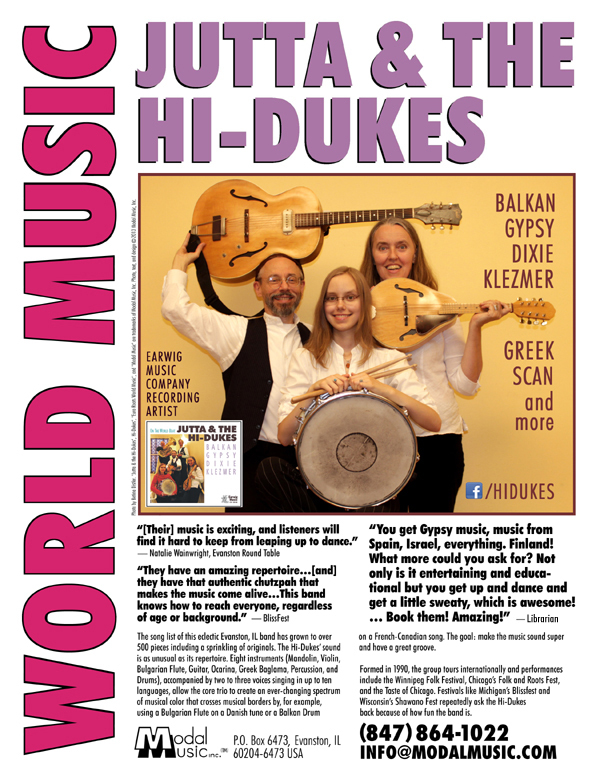 The Hi-Dukes come from and play within various ethnic communities: Danish, Jewish, Greek, African-American, Hispanic, Irish, and Bulgarian, reflecting American diversity. (Great for 4th of July events!) This band knows how to reach all audiences, regardless of age or background. “After over twenty years of focusing on rootsy Blues acts, I decided to branch into World Music because of this eclectic band. Their enthusiastic and authoritative approach to music convinced me to sign them to the Earwig Music label. Their CD, ‘On the World Beat’, is a fine overview of their work. 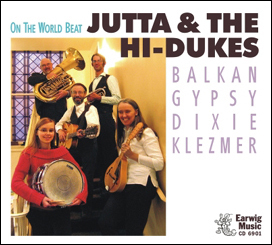 I imagine you will find Jutta & the Hi-Dukes (tm) as exciting as I do!” — Michael Frank, owner of Earwig Music Company. 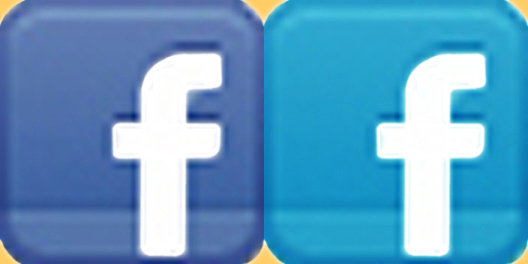 Videos produced by Earth Star Graphics (tm). Web content, design, and text, unless otherwise indicated on this web site © 2018, Modal Music, Inc. (tm). All rights reserved. All photos, unless otherwise indicated on this web site, © Modal Music, Inc. All rights reserved. Audio sound recordings and Video sound recordings performance rights, unless otherwise indicated on this web site, (P) © Modal Music, Inc. (tm). All rights reserved. “Modal Music, Inc.”, “Modal Music”, “Modal Music Records”, “Modal Music Market”, “Modal Market”, “Fine ethnic entertainment since 1988”, “Quality entertainment since 1988”, “Jutta & the Hi-Dukes”, “Jutta & the Hi-Duke”, “Hi-Dukes”, “Hi-Duke”, “Euro Roots World Music”, “Euro Roots”, “Balkan Gypsy Dixie Klezmer”, “Balkan Beats”, “Meet Your Neighbor’s Folk Music”, “Ethnorobics”, “On The World Beat”, “World Music Youth Orchestra and Band” are all trademarks of Modal Music, Inc. (tm). All rights reserved.